Healthy Deviance is the renegade act of being energized, radiant, and resilient in a society where, sadly, most people are either stuck in a downward spiral or just getting by. 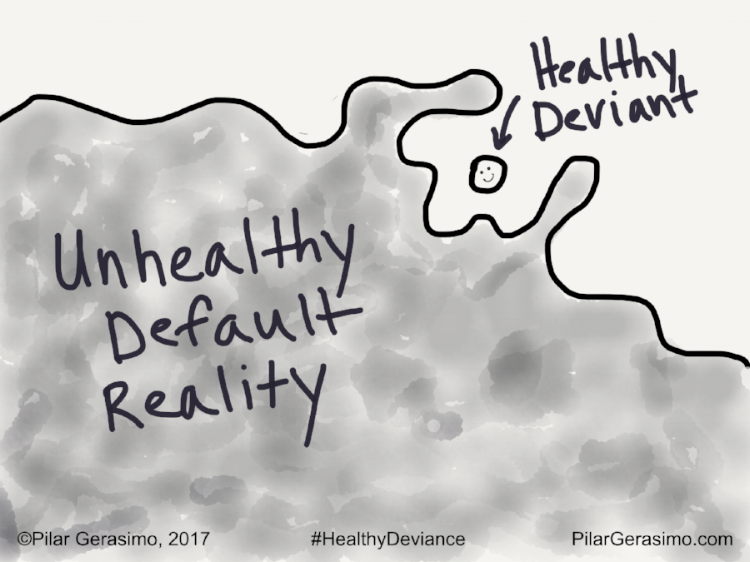 Becoming a Healthy Deviant requires outwitting the so-called "normal" status-quo and craftily evading the vitality-sapping grip of what I call our Unhealthy Default Reality. This is (like most things) easier said than done, but also wildly worth doing. Because the so-called "normal" alternative — well, let's just say it's not pretty. And the rewards of Healthy Deviance are immense. The parasitic, miasmic, co-opting force of the Unhealthy Default Reality surrounds, but cannot subsume, the renegade, resilient, non-conforming Healthy Deviant. The United States now reliably produces more sick, overweight, depressed and anxious people than it does healthy, happy ones. Like, a lot more. Yep, you read that right: According to research published in the Mayo Clinic Proceedings, fewer than three percent of U.S. adults currently observe even four key health practices (eating reasonably well, getting adequate activity, abstaining from smoking, and maintaining a healthy body composition). Worth noting: That research didn't consider other equally crucial health-influencing factors — like sleep, stress regulation, and social connection — known to have a potentially even greater impact on longterm well-being. That means the real number of U.S. adults currently healthy, happy and on track to stay that way probably amounts to less than one percent of the population. Eek! What kind of society produces results like that? What kind of society makes it so confounding to get and stay healthy that only one out of a hundred people can reliably pull it off? The answer is as uncomfortable as it is obvious: A sick, dysfunctional society. That's precisely what we're dealing with now, and it's why so many of us are struggling and suffering. According to the Centers for Disease Control, lifestyle related diseases now account for 86 percent of our nation's $2.7 trillion health care costs. Despite a near-endless torrent of media, products, services, and programs aimed at health-improvement, the majority of people who undertake healthy lifestyle changes fail to maintain them for more than a few months at a time. Why is it so many of us are having such a hard time getting and staying healthy? Because our culture makes it hard. And because it really doesn't like to openly admit that. We have long been encouraged to blame our health problems on our own lack of willpower, our laziness, our stupidity. We're not working hard enough at it, we're told, or we must be "doing it wrong." The real problem, though, is that none of us have been properly prepared for the strange set of challenges and conundrums our unhealthy culture presents us with. In this context, both our culture's conventionally promoted health solutions and its idealized role models are not only unrealistic and ineffective, they are profoundly and maddeningly counterproductive. This nasty trifecta leads to widespread self-blame, self-loathing, desperation, and learned helplessness. All of which make our efforts at health improvement that much harder. The truth is, there's no approved roadmap through the dark forest of health challenges we are facing now. And most of the official roadmaps we've been encouraged to follow are all wrong — corrupted by greed, skewed science, flawed assumptions, and egocentric struggles for power and control. That leaves a whole lot of us having to figure it for ourselves, by trial and error, and by sharing what we've learned the hard way. That's what I'm doing with my Healthy Deviant project: sharing what I've learned as an individual health seeker, as a longtime health journalist, and as a person surrounded by other Healthy Deviants. My goal is to spare others needless struggle, waste, and confusion, and also give anyone who is interested a massive head-start in improving their health and happiness. Okay, so how do you do this thing? How do you begin embracing the tenets of Healthy Deviance and living it for yourself, if you choose? What do Healthy Deviants have in common? What do they know and do differently that make it relatively easy for them to sustain their health and happiness? What can we learn from both their successes and their mistakes that might make healthy living easier for all? Well, I'm writing a whole book about this, so for now, I'll keep it simple. First and foremost, you have to radically reframe what you've been encouraged to think of as "your" problem. By this, I mean whatever litany of personal weight/health/anxiety/body-image issues that plague you, and that you've probably been battling or at least worrying about for years. Here's the reframe: It's not you, friend, it's the mixed-up world you are living in. Remember: 99% of other U.S. adults are in a similar boat. I repeat: This is not about you and your supposed failings. Period. Second, you have to stop doing whatever is not working for you. That may mean giving up the punishing workout routines you dread, or the diets that are making you feel hangry and deprived. It may mean clearing your home of the health and fitness magazines that are just making you feel worse about yourself. It may mean unfollowing a bunch of fitspo social media feeds. It may mean deciding your current doctor is not the person you want to take your health advice from, or deciding that you've had enough health advice, period. I'm not going to dictate those changes. You are. But I can tell you this: If you want to beat our culture's unhealthy odds, you are probably not going to do it by embracing its conventional health prescriptions (especially those that insist it's all about diet and exercise, self-control, more information and advice, more aspirational imagery, blah blah blah). On the contrary, you have to begin seeing, questioning, and operating outside of the conventional defaults, patterns, and assumptions that produced those unhealthy odds in the first place. You have to take the daily, ongoing steps necessary to safely interact with a culture that is currently set up to systematically deplete, disrupt, and co-opt you and all your personal resources on a daily basis. You have to reclaim your autonomy, energy, and attention in ways that serve you, and not the Unhealthy Default Reality. This means you have to constantly replenish and redirect your awareness, energy, and attention, rerouting it away from what you're being told to see/do/be (all of which put you at the mercy of the Unhealthy Default Reality) and toward your own best interests. Basically, you have to make one central choice from which all other choices will follow. That choice: Break the rules, or break yourself. I'm suggesting you break some rules. That includes rules about how you eat, move, and sleep, but also a lot of unspoken rules about how you think and respond to stressful triggers, how you direct your attention, how you interact with media, how you manage your healthcare, and how you spend your money, energy, and time. Breaking societally prescribed rules is not easy or intuitive, particularly at the start. But it's also by no means impossible. And if you go about it the Healthy Deviant way (which is what my forthcoming book is all about), it's actually surprisingly fun, empowering, and a lot easier than what you've probably been trying to do for years. Preemptive Repair — taking proactive steps to get ahead of and quickly heal the damage done to your body-mind as the byproduct of living in depleting, oppressive, and pro-inflammatory physical and sociocultural environment. Continuous Growth and Learning — the adoption of a "growth mindset," and the continuous expansion of practical skill sets that support your physical, mental, emotional, social and spiritual health. Okay, so how do you do all of that? In my book, I outline three Renegade Rituals designed to help you practice and raise your Healthy Deviant game on a daily basis. None of them seems like a huge, dramatic deal on their own, and none of them is particularly difficult to do, but taken together, they are both transformative and quite revolutionary in their impact. The Renegade Rituals empower you to disrupt the Unhealthy Default Reality's claim on you so that you can make whatever other healthy choices you decide are in your own best interest — from nutrition and movement to sleep, social connection, stress management, and more. In effect, the Nonconformist Competencies and Renegade Rituals return you to your natural self — strong, daring, and undaunted — so that you can rise to the challenges of living in the midst of an unhealthy culture without becoming an unwitting victim or agent of it. The primary goal of Healthy Deviance is to help you reclaim the healthy autonomy that is your birthright so you can start living your life on your own terms. So that you can feel good in your own skin. So that you can discover and give your best gifts without being worn ragged. So that you can enjoy the experience of being alive, and being you. Being a Healthy Deviant doesn't mean being some kind of lunatic-fringe outlaw. It doesn't mean running off to a solitary cave where you are denied companionship and earthly pleasures. It doesn't mean being in a constant state of angry defiance, resentment, or resistance. It simply means defying unhealthy social norms that work against you, while simultaneously exploring more creative and regenerative ways of being that serve you — and everyone else — a whole lot better. Wondering if you are a Healthy Deviant? Take the "Healthy Deviant" Quiz!